Press photo in a practice garage. It's a good start. Sure, each week one or two great regional or national acts come through town, but it's the other five or six nights of the week where the real business of building the Bend music scene happens. And that work is being done by talented local artists. If you've only been seeing out-of-town bands when they play locally, it's time to wise up and help these homegrown groups blaze Bend's music trail. After all—if it wasn't for them, there wouldn't be a scene to attract those bigger names in the first place. Enter our new Listen Local segment, your tool to understanding the Bend music scene. Many local artists have poured a lot of sweat into multiple projects before landing on the right sound. But when it hits, it's time to take notice. 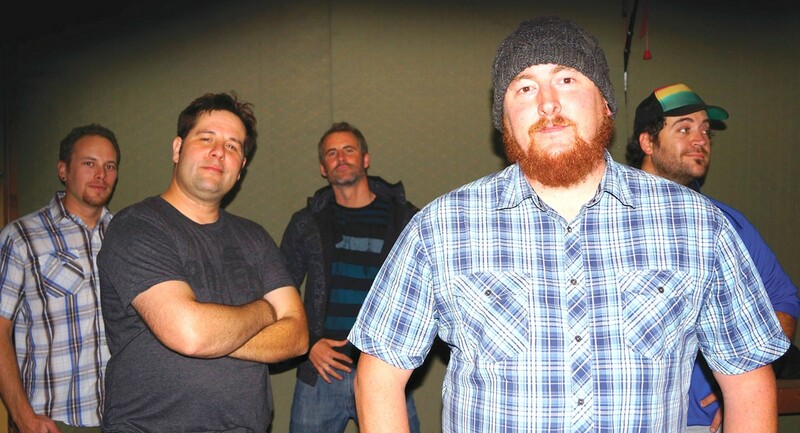 Case in point—Bend's indie-folk group The Rum and The Sea. TR&TS started as the duo of long time Bend guitarists/singers Jason D. Schweitzer and Brian Hinderberger. It has since grown to a five piece ensemble, sporting a full complement of instruments. The band is hitting on all the notes that pervious projects of the two founders didn't. There's a simple cohesive feeling about their music that is indicative of a group of guys having a lot of fun—and judging by audience reactions people going to the shows are, too. "Their music makes me happy," said Bend fan Diana Schaan who has attended three TR&TS's shows. "Their shows are worth the price of a babysitter." The songwriting isn't complicated, which makes their storytelling tangible. The soft quality of the folk guitar and homey vibe of Hinderberger's harmonica ground TR&TS's music in something classically Northwest. It's as perfect for a starry summer night as it is for a winter evening in front of a fireplace. But, according to Hinderberger, lately the band is looking to expand their musical reach. "We're reaching for a stripped-down sound for some of the slower songs," says Hinderberger. "But with two drummers we're noticing that people just really want to dance and so we are focusing on some dancing songs. Jason has been the songwriting force for a lot of the songs. He's been a creative wizard with lyrics and storytelling. It's really the core of our music." But don't think all that dusty folk music keeps these guys from breaking out tunes off the beaten folk music path. The group is known to rearrange pop and hip hop hits with a folk twist like Outkast's "Hey Ya." It's a fan-favorite element of their shows and something the band enjoys doing a lot. "That catches a lot of people off guard," says Hinderberger. "One of the cool things with doing covers is we really bend them. We're focused on original content, but having fun with covers makes it enjoyable." Currently TR&TS are trying not to saturate the Bend music scene with their shows, so look for them to make about one appearance a month around town. So far they've played venues like Riverside Market, Silvermoon Brewery and McMenamins Old St. Francis School. Keep your eyes glued to the Source's blog BENT to find out when you can catch this rising Bend band. Wed., Dec. 21 at The Horned Hand. CORRECTION: Our original story listed The Rum and The Sea's next show incorrectly. Note that their next show is, indeed, Dec. 21, according to the band.